I should be happy because this means our economy is improving. I should be happy because our currency is the best perfoming Asian currency last year. I know I should be happy but this situation is this is hurting my finances a lot! =( My money lost 20% of it's value in 2 years! I know that this is really hurting Filipinos working abroad and their families in the Philippines. 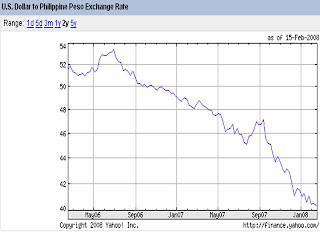 This is not only the result of the US dollar performing very bad but also of the Philippine peso doing very well. The combination of both is quite disastrous for my bank account. To make matters worse, travelling in the Philippines is now quite expensive for me. i hate this thing... dollar is dropping.